In a major shift, US President Barack Obama has signalled a potential compromise on the contentious issue of immigration reform that could provide a path to citizenship to 11 million people, including some 2,40,000 Indians, already in America illegally. Obama suggested in a pair of interviews that the ideological gap is narrowing between the Democrats and Republicans on the issue of overhaul of immigration laws, signaling that he is open to a middle-ground agreement with Republicans to achieve a far-reaching deal this year. Obama said for the first time that he might accept a deal that would offer the 11 million undocumented immigrants in the US legal status instead of full citizenship. House Speaker John Boehner and other Republican leaders had floated just such a proposal last Thursday. Until now, Obama and other Democrats insisted that any compromise on immigration reform contain a path to full citizenship. Anything short of that, they said, would create a two- tiered class system. The plan Boehner outlined on Thursday is "moving in the direction of the principles that I have laid out," Obama said. "There are still some differences. Obviously, the devil is in the details, but it is my firm belief that we can get immigration reform done this year," he said in an online video chat. In an interview with CNN, Obama said that if Boehner were to pursue a plan that ended the deportation of most illegal immigrants and allowed them to pursue citizenship under existing channels, "I'm not sure how wide the divide ends up being" with Democratic proposals. Obama's remarks represented a shift from the administration's hard-line stance that most illegal immigrants must receive a more direct and faster route to citizenship, reflected in the 13-year path included in a bipartisan Senate bill approved last summer, The Washington Post reported. 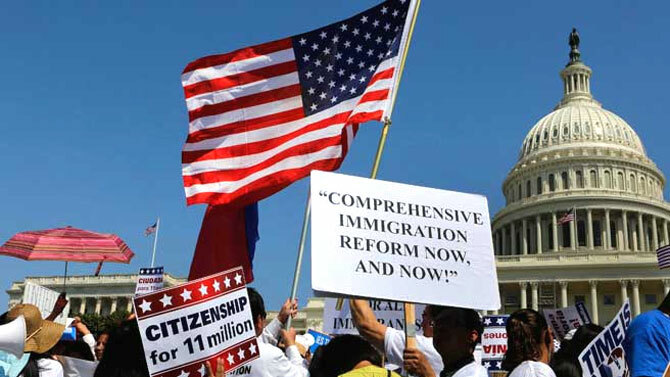 Latino and Asian American advocates for immigration reform, who overwhelmingly supported Obama's reelection bid in 2012, have long pressed the White House to stand firm on that point. Obama administration officials, key congressional allies and some reform advocates have said that the president's rhetoric reflects an emerging understanding among Democrats that they must meet the shifting stance of Republicans with some compromise of their own if they hope to strike a deal to end continued mass deportations. Immigration is Obama's best hope for a big second-term legislative victory after his attempts to push through gun control laws failed last year in the divided Congress. With congressional elections scheduled in November, many Republicans see the immigration measure as a chance to attract Hispanic voters who largely supported Obama and the Democrats in 2012. An estimated 2,40,000 Indian immigrants are among 11.5 million foreigners living illegally in the US without proper immigration documents, according to official figures. The flow of Indians coming clandestinely to the US has, in fact, doubled between 2000 and 2011, said a report by the Department of Homeland Security in March last year. During the same period the total number of illegal foreign immigrants increased from 8.46 million to 11.51 million, it said.